Parking lot on the same block. Parking on the street after 7:00p.m. Live DJs, entertainment depending on special events. The Liberty is open from 12 noon for lunch daily, with Happy Hour from 4pm until 8pm, $1 oyster specials (4-6pm and 10pm-12 midnight) and seasonal drink offers. Our all day dining menu includes gluten free and vegetarian options. The Liberty's exclusive downstairs Clubroom is a perfect location for any private event for up to 30 to 150 people. The entire venue can hold 300 people or more, depending on the set up of your event. The Liberty Bar itself, embodies the spirit of the city she serves; the Liberty to be one’s self. A 4000 square foot bar set over two levels, can hold up to 300 people. The Liberty is located at 29 West 35th Street, between 5th and 6th Avenues, just steps from Herald Square. The space is elegant but informal with soaring 18ft ceilings. 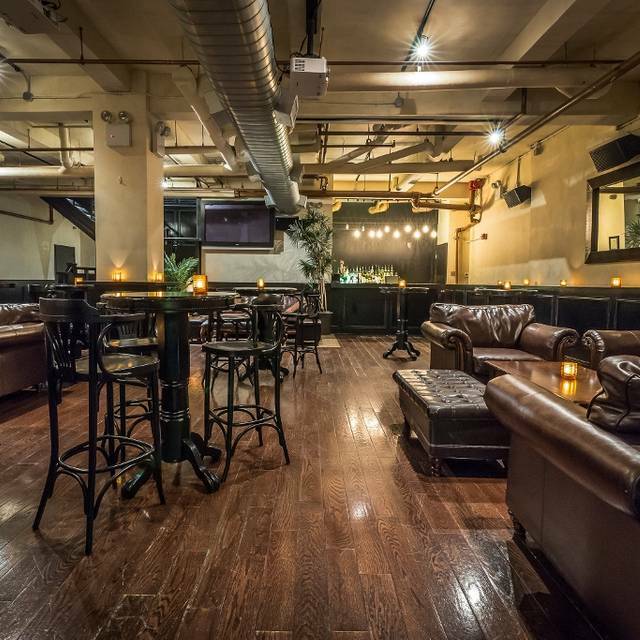 The venue is a marriage of the classic and the contemporary of New York. Came here for after work drinks and a bite so I could catch up with an old friend. It was very loud in the beginning but after happy hour got much more calm. Food was good, bar food but a step up. Drinks were good and reasonable prices. We never felt ignored by service and drinks came quickly. All in, perfect for what we needed. Great place for Clemson sports in NYC. Great food and atmosphere! They recently changed their menu. Waiter was very helpful with finding a gluten free option. Very loud at dinner time. Good place to meet friends for drinks. We read reviews before hand and they were all over the map so we decided to form our own opinion. It was loud but not so much that we couldn’t talk to one another. We had the strip steak and were pleasantly surprised how great it was. We knew we wanted steak and after checking other restaurants, we were shocked at what they were charging. This was around the corner from where we were staying at 32/32 so also convenient as well as great value. It’s clearly a popular spot for happy hour. I love this place. We’ve been there several times. Bartenders are great. The food is very good. Mac and cheese with Marinara sauce is awesome. Huge bar. If you’re looking for an after work spot with loud atmosphere and decent food, this is the place. Also, incredibly affordable by NYC standards. Not a special occasion place by any means, but good for a quick and dirty meetup w friends. Waiter was attentive and staff was very accommodating! A+ service! Great experience for our crowd of 23! Our seating was reserved and available when we arrived. Hostess and manager looked after our group making sure we were happy. The menu selection was average. The food was okay. It’s a bar not a restaurant. If you want to go for drinks after work, it’s perfect. If you want to eat a meal, go some place else. We arrived early around noon and the place was empty. I ordered an Irish coffee and got coffee with whiskey and a side of cream and sugar. They were prepping for an event at 1PM so it could be better. The food was average but nothing special. I would consider attending again maybe for drinks or something small. Much better options for brunch at the same or greater value. The food was mediocre at best. Ordered my burger medium (assuming they might mess up a med-rare) and it was medium well.... My friend got the Portobello sandwich and was not impressed either. Food is very basic. Calamari seemed to be the frozen kind. It was okay, but overall the food was not a hit. No creativity at all. It’s a bar, not a restaurant (yes they serve food). It was too loud, we left and went someplace else. I’m sure it’s great for a bar. Great food and drinks, excellent service, and an overall pleasant atmosphere. We had a great time. The food was terrible, the service was slow despite the few people in the restaurant and I will never recommend anyone I like to go back there. Plus the menu was really expensive, all of the people in my party barely touched our food and send most of it back uneaten despite being extremely hungry going into the restaurant. Good food and service. But very loud and we sat in the back with a constant draft of cold air. We came at happy hour and had Oysters and Bubbly. Good food for a good price!!!!! This is more of a bar than restaurant. Menu in open table did not match what was offered. Large TVs for watching sports are a positive. Would not recommend dining here with kids. The food was mediocre, the menu choice very limited. Empty restaurant, no ambiance and very expensive. Very good food and a great space. We sat at our table for 30 minutes and no one came to even take a drink order. The restaurant was not very busy. The service was really really slow and we inquired several times. Management did not charge for the appetizers that we ordered so that was appreciated but we were really disappointed in the service. We had a casual company holiday party here and they were GREAT. I called to make a reservation for 10-15 people and they promised they would block off a whole section of the restaurant for us with no minimum per person or cost to hold the space. We arrived, the area was sectioned off, we had our own waiter and they were AWESOME. Brought us a bill with the gratuity added in - overall The Liberty made the stressful experience of planning a holiday party in NYC completely non-existent. Everyone had a great time and really appreciated it! We came in at noon and ordered from lunchy menu. fish & chips and butter milk chicken sandwich. It was the worst fish and chips I have ever tasted. Fish tasted old and chips r soggy. Butter milk fried chicken was small and dry. Side of salad was nice. The server was nice. My cousin didn’t like the sauce that came with the fish and chips she switched and gave us a discount for that. They were hosting a special event for Salvation Army so it was loud. Overall experience was just ok. Wont go back. Food was great, one of the best fish and chips I've ever had. Casual pub style restuarant. Only knock was the service was a slow (but food came quickly). This is a bar, which is fine...but not a place to dine. The Liberty was fine but we anticipated a restaurant.... no knock on them. Classic go to spot. It’s a little noisy and you find yourself shouting when talking in a group at a table, but never disappoints. Good food to share and drinks. Would recommend! Great food especially the wings. I had a nice meal but salmon sliders were dry especially the individual rolls. Great location. Fries were delicious!! So many came in my side order and they were definitely addictive. Had to stop myself from eating them! Place was very loud and sat at two different tables and both were wobbly/shaky. Went because it came up in a search for gluten free pizza near our hotel. Not good. Runny Spinach/Artichoke dip and tired oysters. Cool place. Good vibe. Food is really good. Margaritas are very good. Coconut shrimp and tempura green beans are amazing. nice size portions to share. friendly staff. great for lunch. Good food. Nicely decorated for Halloween. Service was great! It's more on the casual side but the food is a step above a typical casual restaurant, if that makes sense. Food was tasty and the service was good. Lots of big screen TV's if you wanted to watch a game. It was a good place. No complaints. If I'm in the area again, I would go back.